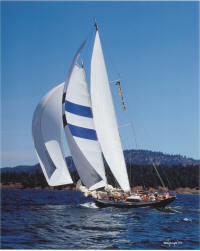 ELLIOTT / PATTISON SAILMAKERS have been making custom schooner sails since our start in 1971. Skip Elliott grew up in the 60’s sailing on some of the great boats of that era including Golden Hind, Kelpie, and racing to Hawaii and Acapulco on the famous Serena. Since that time he has continued his love for these beautiful yachts and continues to transform that love into spectacular, hand crafted sails. Each yacht is carefully measured for size and finish details. This information is then used to create an exact computer design for the finished product, and the fabric is cut using our Autometrix computer driven cutter. All of our custom sails are completely designed and built in the USA, right here at our loft in Newport Beach. Skip chooses only the best fabric for both shape holding and easy handling for each sail. His designs utilize traditional mitered and cross cut panel layouts depending on the aspect ratio and use of each sail and each sail is than hand finished insuring proper fit and function. You will find our sails on many of the top schooners today including Dennis Conner’s recently restored “Fame”, Barlovento, Astor, Kelpie, Rose of Sharon, Lucky Star, Curlew, Pilot, and Wanderlur 2 to name just a few.